Hip No. 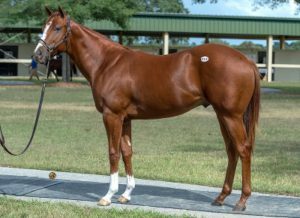 516, Our Time, a chestnut colt by Kantharos consigned by Summerfield (Francis & Barbara Vanlangendonck), Agent, went to Stonestreet Stables LLC for $190,000 to top the first Open session of the Ocala Breeders’ Sales Company’s 2018 October Yearling Sale. He’s out of Golden Trumpet, by Formal Gold, from the family of grade one winner Wilderness Song. Hip No. 311, a son of Kitten’s Joy consigned by Woodford Thoroughbreds, Agent, was purchased by Ann Maher-Springman, Agent for Rashed Yousef Bouresly, for $100,000. The dark bay or brown colt, a full brother to stakes winner Kuwait Currency, is out of Thebignbadestbunny, by Smart Strike. Hip No. 341, a son of Mark Valeski consigned by Magnolia Point Thoroughbreds, Agent, went to Tracy Farmer for $85,000. Out of Vindi Princess, by Vindication, the bay colt is a half brother to stakes winner Big Drink of Water, who picked up his third stakes win in the Fitz Dixon, Jr. Memorial Stakes at Presque Isle last Thursday. Smokey Willow Farm paid $80,000 for Hip No. 458, a son of Cairo Prince consigned by Stephens Thoroughbreds LLC, Agent. The dark bay or brown colt is out of Day of Obligation, by Deputy Minister, from the family of grade one stakes winner Confessional. Hip No. 489, a son of The Big Beast consigned by Beth Bayer, Agent, went to S G V Thoroughbreds LLC for $70,000. The bay colt is out of Faith Hall, by High Cotton, a half sister to graded stakes placed Show Me the Bling. For the session, 143 yearlings sold for a total of $1,967,300, averaging $13,757, with a $7,000 median figure. The buyback percentage was 27%. The sale continues Thursday at 12:00 noon with Hip No.’s 551 – 789 selling in the second Open session. The sale will again be streamed live via the OBS website as well as the DRF, TDN and BloodHorse websites. Current information about OBS sales, consignors and graduates is now also available via social media sites Facebook and Twitter. A link on the homepage directs users to either site.